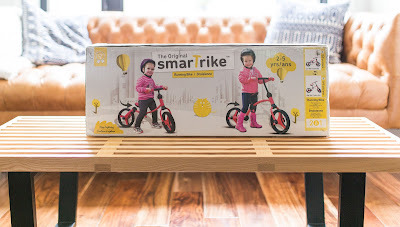 Smocks and Sprinkles: Smart -Trike Balance Bike Review! 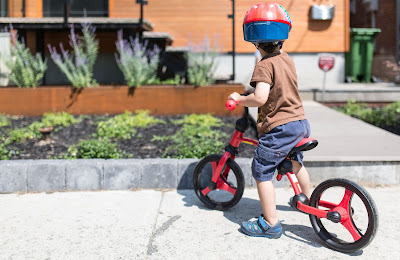 Smart -Trike Balance Bike Review! 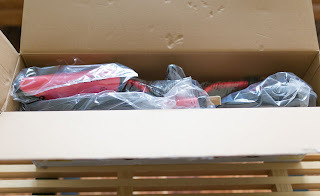 Anyway, back to the topic I meant to blog about. A friend of mine asked if I would review the Smart-Trike Balance Bike and I happily agreed (any toy that will keep my three-year-old busy will be gratefully accepted). 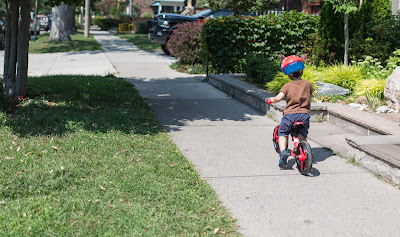 My guy is more of a scooter kid so I was curious about how he would react to the balance bike. 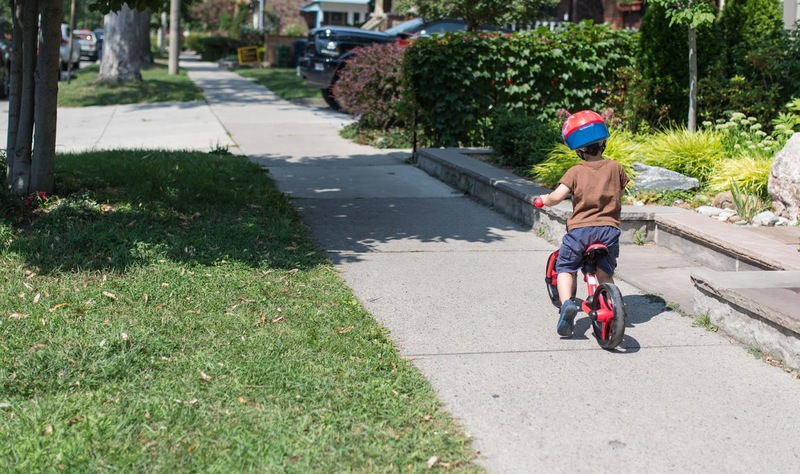 Balance bikes are really awesome to get kids ready for a two-wheeler with pedals. Everyone swears by them! 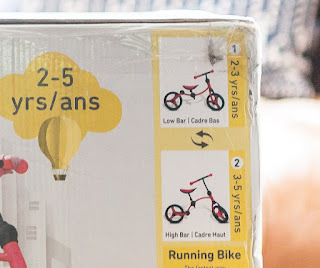 My daughter attended a learn-to-bike camp this summer and they trained her to ride her bike (with no training wheels) using a balance bike in only 3 days! Once you can glide on a balance bike you can easily transition to a traditional bike with pedals. 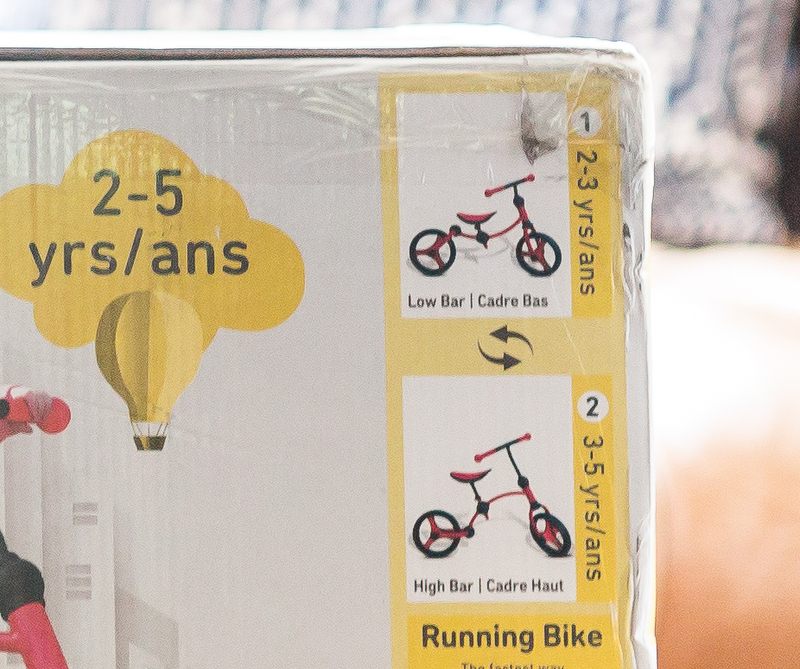 This bike comes in a large box that is easy to carry. I was pleasantly surprised at how light it was. There are very few pieces to put together and it took me like 5 minutes to assemble it. Big points in my books! All I needed was the little Allen wrench that it came with. Instructions were clear and easy to follow. The best part about this bike is it grows with your child. Once your child outgrows the "low bar" phase, you can just flip the frame over and they can keep using it...no need to buy a new bike! Totally worth it since our munchkins grow like weeds. You will easily get several summers out of this bike. Love how it grows with your child! Ages 2 to 5! My son is three and he just fit the "high" frame version (with lots of room to grow into it). It was easy to adjust the seat and the handle bar for his height. He seriously just hopped on the bike and away he went. It was effortless for him to maneuver the bike since it is super lightweight. He was able to handle it without difficulty. 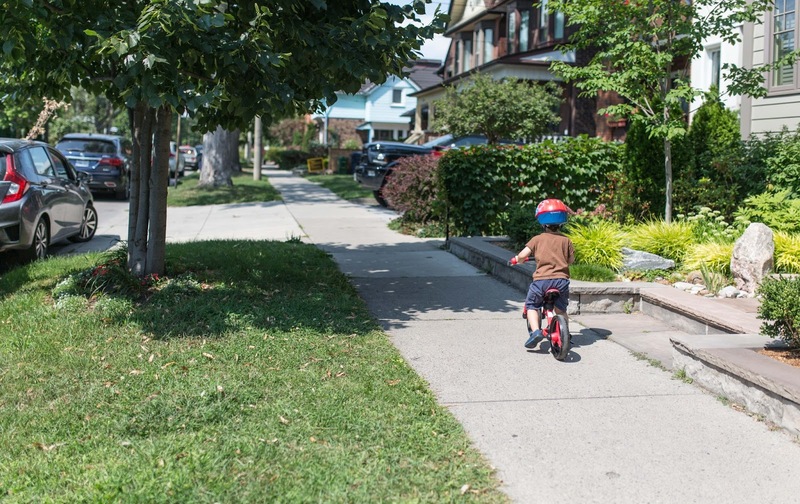 And we all know that half-way to the park when our kid suddenly decides they don't want to bike anymore, we will be carrying that bike! The lighter, the better! Also love that the tires will never go flat (no need to ever pull the bike pump out). 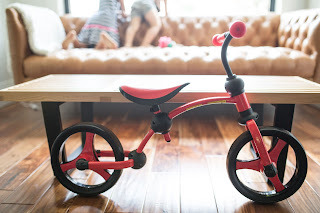 Overall, I would highly recommend this bike to anyone searching for a balance bike. 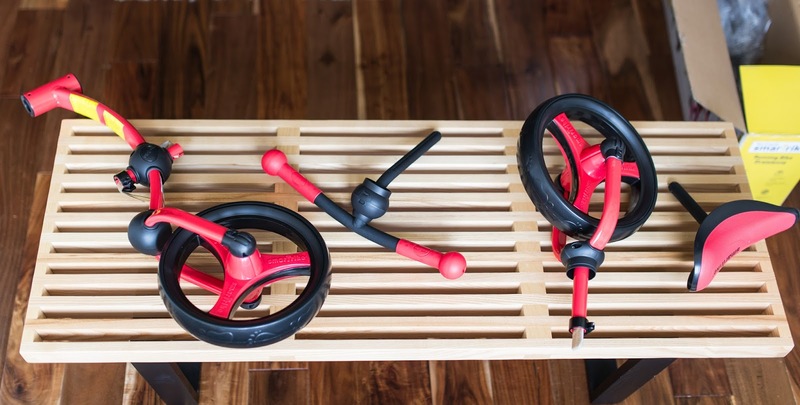 The price point is very reasonable and it is a high quality product that grows with your child (and best of all, it tires out our little ones). 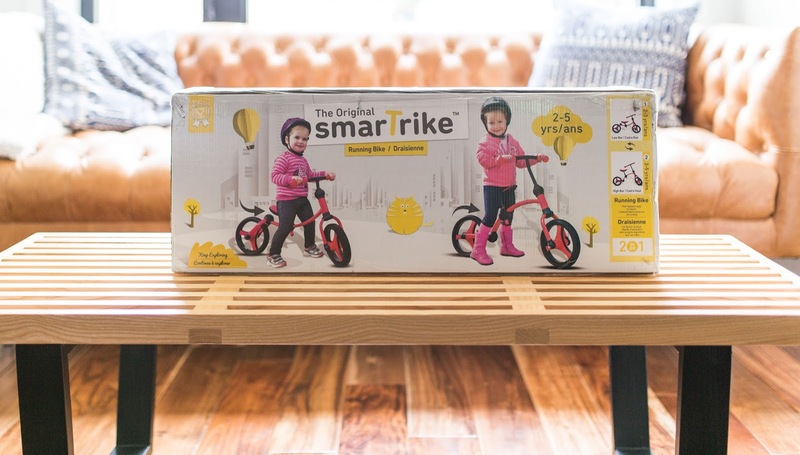 Way to go smarTrike!